Looking to get some well deserved pampering? Having a manicure or pedicure may well be one of the best ways to give yourself a treat. It's relaxing and it makes your hands and feet look and feel amazing. A great place to have your hands and feet treated is at the Baba Beauty lounge. 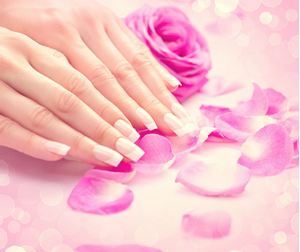 An exceptional beauty and nail salon, that specializes in delivering the most relaxing and efficient manicures, pedicures, facials, nail and waxing treatments in Milton Keynes. We keep customer satisfaction our highest priority, which allows us to focus all our treatments to the client’s particular needs. Did you Know: People first started having manicures some 5000 years ago. In a standard Manicure your hands are cleansed and thoroughly soaked and hydrated to replenish their moisture content. The nails are then attended to and sculpted beautifully to bring out their perfect shape. Our professional manicure technician will then apply softening lotions and oils to the cuticles to make them soft and then push them back to reveal the beautiful shape of the nail. The nails are then nourished and buffed to ensure they have that healthy glow. The manicure is completed with your choice of polish. You can choose between a wide variety of colours from brands like CND Vinylux, OPI and China Glaze. You can also upgrade to a CND Shellac finish. If you read what a manicure is in the previous section, then its quite easy to determine what a pedicure is …. well, a Pedicure is basically a beauty treatment performed in a nail salon for your feet and toenails. Like the manicure, the pedicure consists of a number of individual treatments from clipping and filing toe nails all the way to a deluxe pedicure which includes a foot massage and paraffin wax treatment. See the individual pedicure treatments to select your preferences. What are the benefits of hand and foot nail care? The basic aim of a manicure or pedicure is to make your hands, feet and nails look healthy and gorgeous. Our hands go through a lot in our daily routines, which roughens and dries the hands, chips or scuffs the nails. Hands are exposed to various chemicals in everyday households products and this dries the skin and nails. Feet usually have less exposure than hands, but if you wear sandals or open shoes they too are exposed to the elements. As nails and cuticles grow naturally, the shape of the nails and cuticles may well not grow to be very flattering. For these reasons and much more, it’s always a great idea to have your hands and feet manicured and pedicured regularly at a professional nail salon like Baba Beauty Lounge. With professionals who know and understand hands, feet and nails, you’ll have them looking at their very best in no time at all. Why choose Baba beauty lounge? The answer lies in the exceptional attention to detail. We ensure that our clients get the best treatments and quality products. This is why we only source our supplies direct from the manufacture or authorised suppliers. We use nothing but genuine quality products and brands like CND Shellac, CND Vinylux, OPI and China Glaze. This allows us to create and deliver the very best manicure and pedicure service that gives you beautiful hands, nails and feet that you can be proud to show off. All our products are applied by professional nail technicians, who are specially trained, qualified, experienced and insured to deliver the perfect treatment for your hands, feet and nails. Baba Beauty lounge is the professional Nail Salon in Milton Keynes. We take hygiene and your safety very seriously. All our equipment is standardized for safe use and practice in a Nail bar, and we only use products designed for professional application. First we clean and wash the equipment after each customer, we then disinfect the equipment using a EPA registered hospital grade disinfectant, followed by sterilization under UV light. You can rest assured; your nails and health are our number one priority at Baba Beauty lounge. Which Manicure treatments are available at Baba beauty lounge? There are a number of different treatments that you can have at our nail salon. Depending on your preference and requirement, you can have the simple nail cut and tidy or the shape and paint, a simple soak off to remove previously applied nail polish or shellac, or you can opt for one of the manicures on offer. You can also try the super fabulous CND Shellac nails, or nail art. All our treatments are created to give the very best care for your hand and nails. Which Pedicure treatments are available at Baba beauty lounge? Similar to the manicure treatments, we have a number of Pedicure treatments available at the nail salon, you can have the simple toe nail cut and tidy or the toe nail shape and paint, a simple soak off to remove previously applied nail polish or shellac, or you can opt for one of the Pedicures on offer. You can also try the super fabulous CND Shellac nails, or nail art. All our treatments are created to give the very best care for your feet and toe nails. Do you cut Cuticles ? As standard we do not cut cuticles. The cuticle is a barrier to protect and seal the nail, cutting a cuticle exposes the cuticle to possible infection. We, therefore, will apply a cuticle oil followed by push and reshaping the cuticle without cutting it. What are CND Shellac Nails? This is the special type of nail polish called a shellac. It is designed to last longer, the manufacturer, CND, claims 14 days wear, and most importantly NO Nail Damage. The Shellac process is designed to be a professionally applied in a nail salon. You can have a shellac treatment on fingernails and or toe nails. Our shellac treatment follows the procedure directed by CND. The process involves clipping and filing your nails as required, followed by tiding up your cuticles. A base coat is applied to your nails, followed by the shellac color of your choice, we have over 50 CND Shellac colour shades for you to choose from, this is then finished with the amazing CND Xpress5 topcoat to give you that mesmerizing glass finish. Every coat is cured under a genuine CND UV light for the perfect finish and lasting perfection. What is the deluxe manicure or pedicure? This is the crème de la crème. The deluxe is similar to the standard manicure or pedicure, except its finished with a choice of either paraffin wax treatment or a mask. Warm paraffin wax is applied to the hands or feet, and they are then wrapped in warm towel or mitts and the paraffin wax is left to do its job. The paraffin wax acts as an emollient, which holds and traps the moisture in your hands, feet and nails. When the wax is removed, it leaves your skin soft , smooth and moisturized. The deluxe manicure or pedicure finishes with a relaxing hand or foot massage.